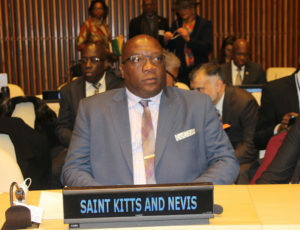 BASSETERRE, St. Kitts, – Prime Minister the Honourable Dr. Timothy Harris has expressed the view that the classification of the Federation of St. Kitts and Nevis as a high-income country is limiting the nation’s ability to access much needed financial assistance in times of disaster. Against this backdrop, Prime Minister Harris has called for a re-evaluation of the Gross Domestic Product (GDP) per capita criterion for the graduation of countries. 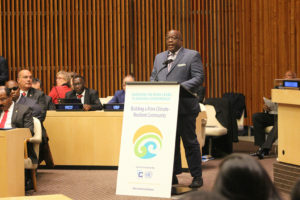 Held under the theme “Building a More Climate Resilient Community,” the pledging conference sought to mobilize support to assist CARICOM countries rebuild following the passage of two Category 5 hurricanes in September. Hurricanes Irma and Maria caused devastation and millions of dollars worth of damage to housing, agriculture and public infrastructure in several CARICOM countries, including Dominica, St. Kitts and Nevis, Barbuda and Anguilla. The Prime Minister of St. Kitts and Nevis also drew delegates’ attention to the cumbersome procedures countries often face when trying to obtain funds that have been pledged. This, according to Harris, has led to long delays in accessing vital resources. As such, Prime Minister Harris underscored the need for the establishment of a fast-track mechanism to ensure that funds are disbursed in a timely but transparent manner if they are to make a real impact on the dire circumstances in the region.